A Spectacular 4 course Sharing Platter for £59.95 worth £100! 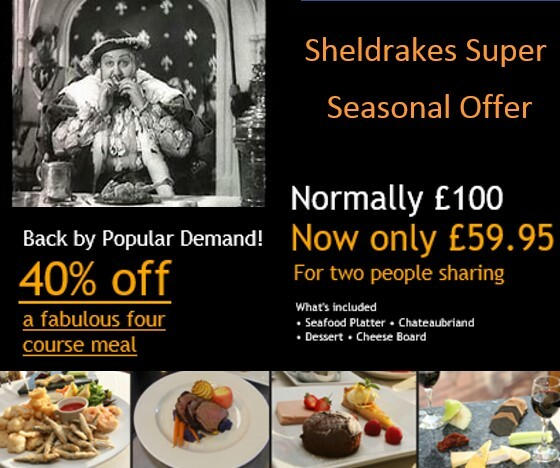 Contact Sheldrakes Restaurant to book your table, stating that you intend to use the Sharing Platter Voucher. Redeem your meal and enjoy! 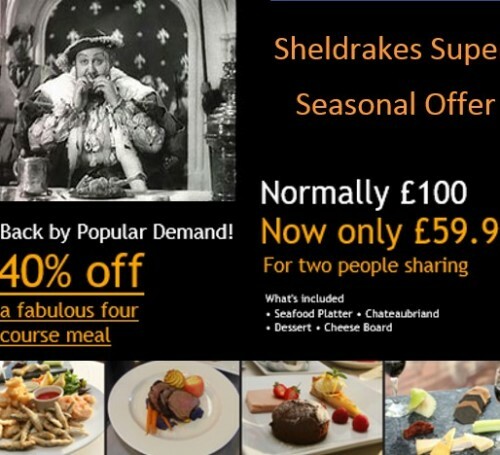 Limited 1 per 2 people.,May buy multiples as gifts., Drinks & service charge not included., Advance booking required by email on bookings@sheldrakesrestaurant.co.uk., Valid from Sunday evening -Friday Evening (19:00 – 22:00)., Booking must be made within 14 days of the expiry date and are non-cancellable., Excludes Bank Holidays and special days at the discretion of the management., Not valid with other offers., Voucher valid until March 2019., Valid for eating in only., All items must be redeemed during a single visit., Valid for online purchase only.